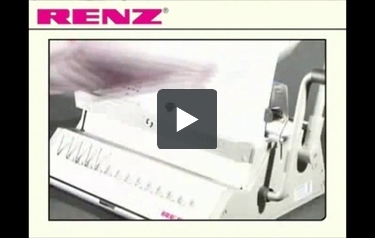 The Renz ECO S 360 is one of the newest additions to the Renz line of binding machines and is part of their new 360 line of binding equipment. This ECO-S 360 is a manual 2:1 pitch legal sized twin loop wire binding machine that can be upgraded to an electric machine with the simple addition of an electric modular drive motor. The ECO S360 is the only machine of its kind that allows for this type of upgrade. This makes it possible for growing organziations to upgrade their existing machine without the need to buy a whole new system if their volume of document finishing increases. The ECO-S 360 is designed to provide an efficient workflow and offers a compact design and durable construction. It includes a high quality fully adjustable manual wire closer and features fully disengageable punching pins to allow for binding any size of book up to fourteen inches in length. Introducing the Eco S 360 from Renz. The Eco S 360 is a manually operated wire comb binding machine designed to give efficient workflow. Simply measure your document to determine the comb needed. Select the corresponding size on the attachment screw to set the opening hooks and choose A4 or A5. You also have the additional option of selecting from 28 punch pins which can be disengaged individually. Select the comb and place it onto the machine. Punching the document is made easy. Simply pull the punching lever towards you in one easy motion. Once you have punched your document, you can then load it onto the comb in the finished order. Take your document and slide it onto the closing mechanism, pull the small lever towards you and release. Your document is now bound and finished. The Eco S 360 comes with additional features and the option to upgrade to an electric punch, giving the user a greater degree of control. The Eco S 360 from Renz.